Options for summer outings in our little corner of the Rio Grande National Forest are plentiful. There’s something different and fun every weekend. Don’t believe me, check out our South Fork website. 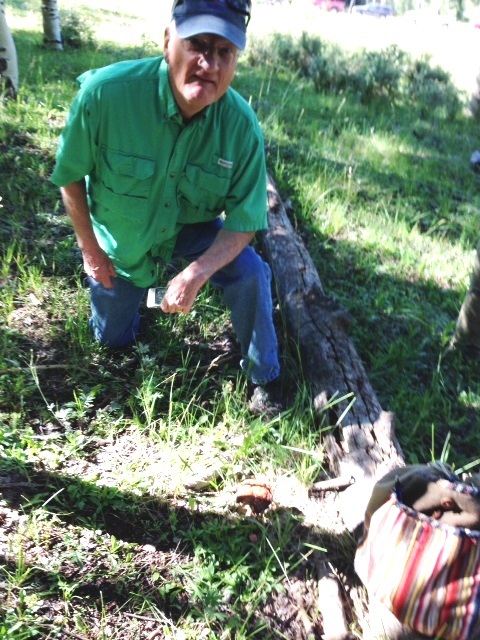 Last weekend we joined the fun on the 14th annual Mushroom Foray. What’s a Mushroom Foray you ask? I wondered myself knowing foray is to raid and plunder. Surely, that wasn’t the intent. 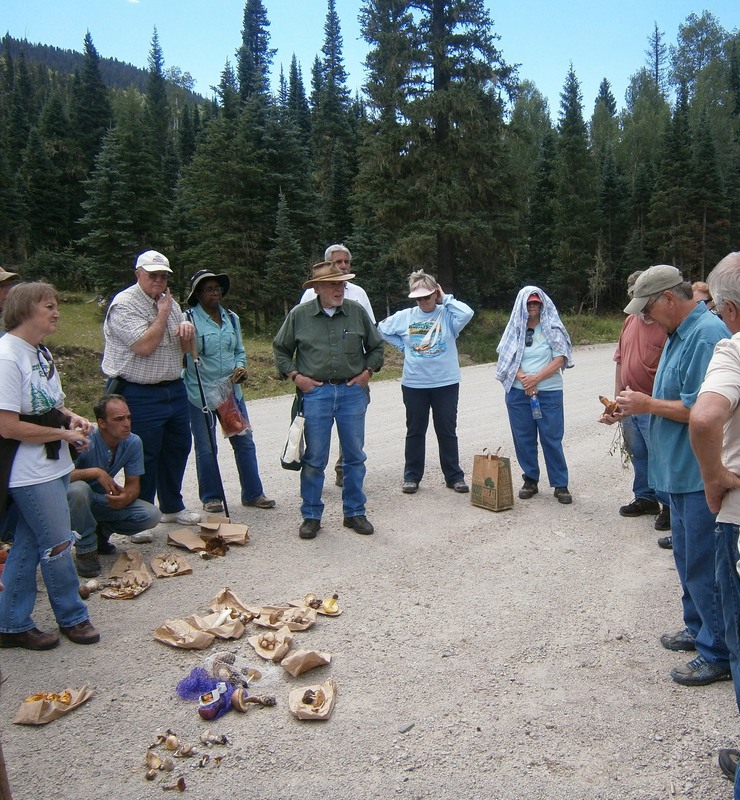 I contacted the Visitor Center for information and learned the Mushroom Foray is a simple adventure into the forest to learn to identify edible mushrooms. And, if you check Dictionary.com, you’ll find that venturing into something new is a less used meaning of the word. So off we went into the forest on one of the many Rio Grande Forest Service trails. We stopped at three different elevations to find different species of mushrooms. At the first stop, we gathered our paper sacks and hiked up the hill into the woods. 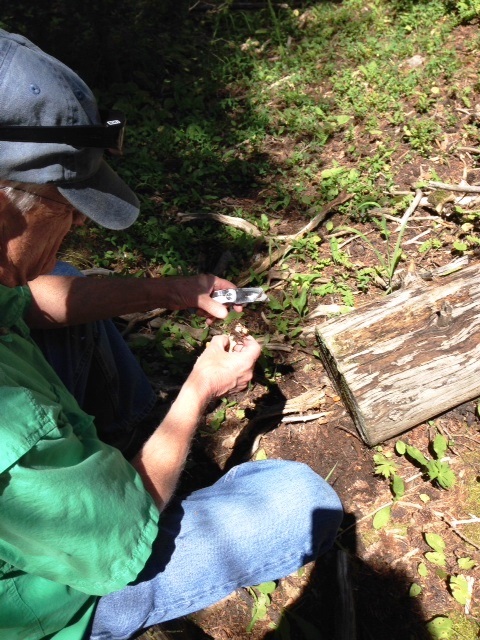 My husband and I were a little fearful that we’d be the only ones of the twenty folks on the foray that didn’t find specimens, but we soldiered on. Our fears were found less for we quickly located a mushroom by a fallen log and prepared to extract the bloom from its habitat. I dutifully made notes of the location on the sack and carefully dug the mushroom then dropped it in the sack. My husband, meantime, kept searching. 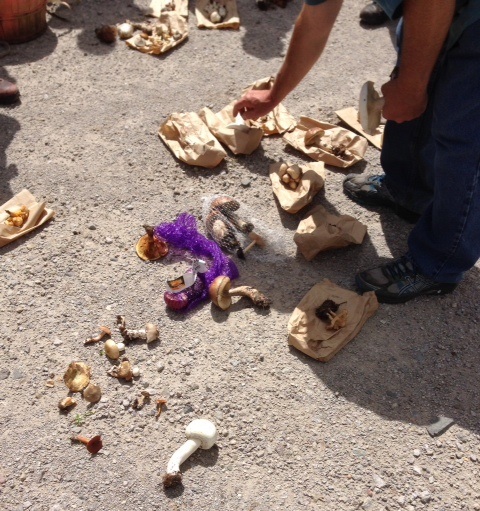 We found six different varieties of mushrooms and proudly dumped our cache for identification along with the mushrooms others had collected. Alas, only one of our finds was an edible variety. On our third and last stop, we ate our sack lunch then started searching again. More sure this time of what to look for, we were careful to dig only the ones we thought were edible. In the picture below, the large white mushroom was the star of the pickings. It was the biggest example for the day of an edible mushroom…and it was ours. The day provided a truly fun foray and an educational adventure. Now, if we are ever stranded in the forest, we won’t starve. We know what mushrooms we can eat. Although my husband isn’t so sure eating a mushroom is better than starving. Me, I love the fungus blooms.